Bill Gates Secret Santa Photoshop A Bill Gates Secret Santa Photoshop job. 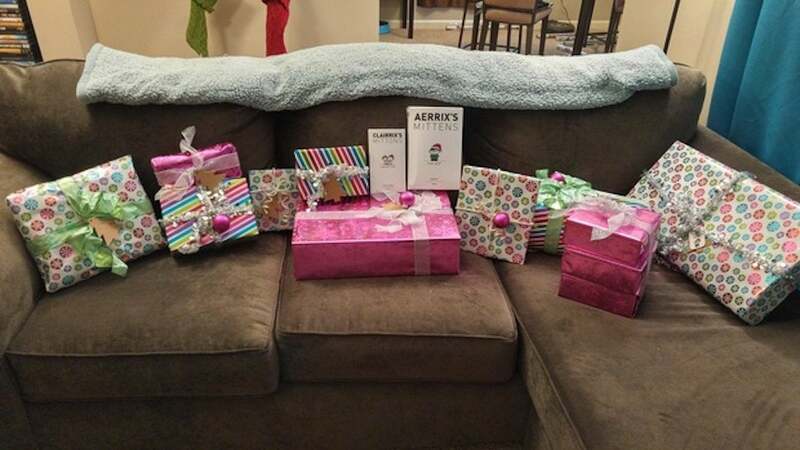 Alicia, also known as Reddit user "Aerrix" (who describes herself as a woman who loves video games, The Legend of Zelda, The Little Mermaid, Harry Potter and Nintendo) got blown off by her Secret Santa last year. But she faithfully signed up again. And was that ever a smart move. "P.S. I won't be able to consult with the Sorting Hat but I can tell that you are quite clever – so I got a pair of Ravenclaw slippers from Hot Topic." A Bill Gates 2016 Secret Santa gift. The first box she opened said "Aerrix's Mittens" and "Clairrix's Mittens." "My dog's name is Claire, btw, how freakin CUTE IS THAT?! He got me ZELDA MITTENS and you guys, matching ones for my DOWG!" Yes, Bill Gates bought matching mittens for a human and her dog. To answer her question, it is VERY CUTE. ... and these movies, three of his favorites. He got her a paper replica of the Master Sword from "Skyward Sword." And he got her a Cajun cookbook because her profile says she's from southern Louisiana and misses her family's home cooking. On the book was a handwritten note that said, "Aerrix, Since you're originally from Louisiana and miss your Uncle's Cajun cooking, I thought you might enjoy trying some of the recipes from this cookbook." ... and it was a Xbox One Minecraft Edition with a handwritten note, "I love my Xbox and thought you might like one too." She writes, "Well yes, yes I would! And I do!" But he didn't stop there. He also got her a NES Classic Edition. She said, "I've wanted one of these SO BAD! And NOW I HAVE ONE! BECAUSE BILL GATES!" And like whipped cream on a triple portion of hot apple pie, he also threw in the "Halo 5: Guardians" game ("Limited Edition, of course") and the new "Tomb Raider" game and a year's worth of Xbox Live Gold membership cards. "WOOOOO!" she wrote. But the funniest gift in the box was a beaded Zelda-themed picture frame (he knew from her profile that she loves to bead). Inside the frame was a photo of her family with Gates added in. She wrote, "The picture in it is just the best...he used my profile picture on here of me, my husband, and my dog, PHOTOSHOPPED HIMSELF IN, and put Santa hats on all of us! Come on now, that is the cutest thing!"